As a young man, Frederick Matthias (F. M.) Alexander (1869-1955) was a Shakespearean actor touring in Australia and Tasmania. A chronic hoarse voice interrupted his burgeoning career. When no medical treatment helped, he looked at his own use for the source of his vocal trouble. Through nine years of rigorous self-observation and experimentation, he solved his problem, developed a full, rich voice, and discovered what he named the Primary Control. Alexander observed that the relationship between the head, neck, and torso is primary in controlling movement and function. Compressive movement habits interfere with the body's ingenious design. Having control over the primary control restores the innate postural response-a natural, dynamic force that counters gravity and easily guides the torso upward. For over 100 years, actors, dancers, singers and musicians have used the Alexander Technique in order to be more effective on stage. 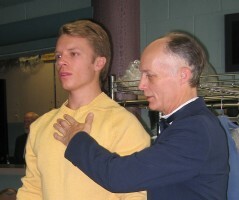 The Technique is taught worldwide in universities and conservatories, including the Juilliard School and Yale School of Drama. Leaders in the field of mind/body medicine and behavioral science throughout this century have supported Alexander's innovative research. Clinical studies have shown that the Technique improves breathing capacity and posture, modifies stress responses and is, for those who suffer from chronic pain, the preferred method for long-term relief. In a lesson, your teacher helps you (one-on-one)-with words and touch-to understand how your movement style is hindering you and to approach movement differently. Using a unique hands-on method to elicit your primary control, s/he gives you an experience of dynamic expansion. With this expert guidance, you learn how to replicate that expansion on your own. Duration of study depends upon your initial condition and personal goals. To enjoy the full benefit, a recommended course is 30 private sessions. Lessons average 30 to 45 minutes. Rates vary nationally from $40-$80. The goal is to use what you learn independently so you can participate in the pursuits you enjoy with renewed energy, comfort, and confidence. You learn to improve overall functioning. The American Society for the Alexander Technique (AmSAT) is an internationally recognized, tax-exempt, nonprofit corporation. Its purposes include establishing and maintaining standards for the certification of teachers and teacher training courses; providing services to its members; and educating the public about the F. M. Alexander Technique.